Window-Eyes is nothing less than the most stable, secure and customizable screen reader available on the market today. Featuring comprehensive support for computers running Windows 10, Windows 8.1, Windows 8, Windows 7, Windows Vista, Windows Server 2008, and Windows Server 2012, Window-Eyes enables individuals who are blind or visually impaired to be completely independent on a PC and be more successful and productive at school and in the workplace. Window-Eyes gives total control over what you hear and how you hear it. Plus, with its enhanced Braille support that control is extended to what you feel as well. On top of all that, the power and stability of Window-Eyes means that most applications work right out of the box with no need for endless tinkering in order to get them to function properly. Window-Eyes is your key to opening the doors of a world with unlimited information. A world where work takes precedence over technical hassles. Window-Eyes is a leading screen reading software application for the blind and visually impaired, that converts components of the Windows operating system into synthesized speech allowing for complete and total access to Windows based computer systems. Window-Eyes integration into Windows is seamless, providing you with instant access to the operating system without having to learn a complicated set of keystrokes. Applications that utilize standard Microsoft controls will be spoken automatically with little to no configuration necessary. Other applications may require simple modifications to Window-Eyes whose options are easily accessible via a well organized, and state-of-the art user interface called the Window-Eyes control panel. 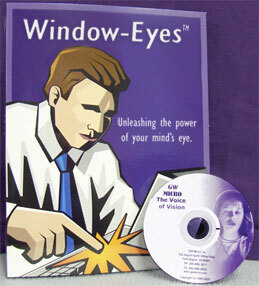 The Window-Eyes User's Guide (available in a multitude of formats -- see below) provides detailed instructions and examples for beginning configuration options such as voice parameters and verbosity, as well as advanced instruction for tasks such as using Window-Eyes apps, navigating the web and creating customized settings for individual applications. Ai Squared is committed to our customers and helping our customers accomplish their academic and vocational goals. Our partnerships with mainstream companies such as Microsoft, Adobe, and Apple allows us to make Window-Eyes one of the primary tools for testing product accessibility. We work hard to make sure that Window-Eyes provides you with the best access possible for the most popular applications. You expect a lot from Window-Eyes. And you should. We're raising those expectations further with Window-Eyes, designed to harness the power of the widely used Microsoft Windows operating system. Windows has the flexibility to be customized and meet your individual work habits and preferences. Window-Eyes does the same, allowing you to maximize your productivity when working on your PC. Support for the Accessible Rich Internet Applications Suite (ARIA) including landmarks, live regions and more. Custom apps (and support for app development) provide users with the tools to enhance the accessibility and usability of third party applications, the operating system, and even Window-Eyes itself. Ai Squared is also proud to offer App Central, a centralized app repository where both users and developers can gather to obtain, distribute and discuss Window-Eyes apps. Works with many applications "out of the box." Little or no extra configuration required.